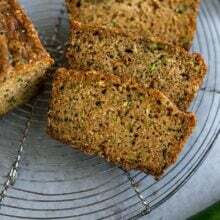 Zucchini Banana Bread-a blend of your two favorite breads! 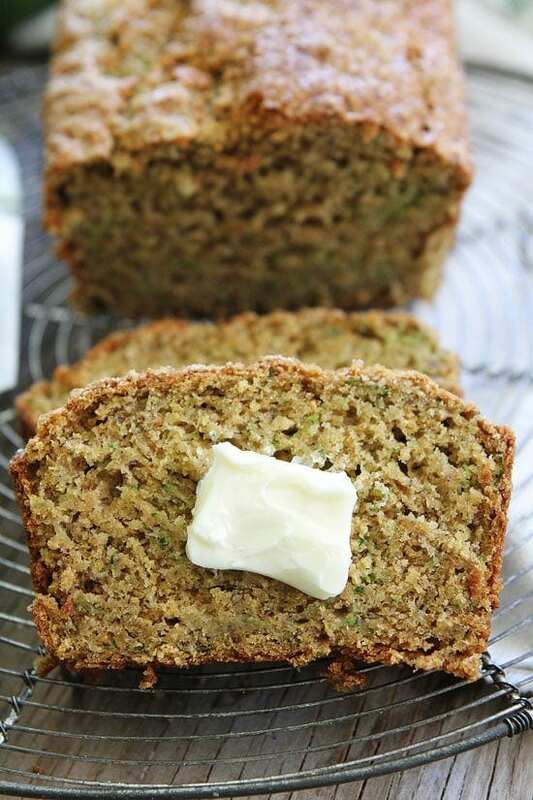 This easy quick bread is a great way to use up summer zucchini and brown bananas! What do you do when you have a pile of zucchini and brown bananas sitting on your counter? You make Zucchini Banana Bread! Well, at least that is what I did and I think you should too because this bread is crazy good! I wanted to keep things on the healthier side, so I used whole wheat flour, coconut oil, and added in mashed bananas and shredded zucchini. The loaf baked up beautifully! Both of our boys devoured this bread and I was more than ok with that since they were getting their fruits and veggies! 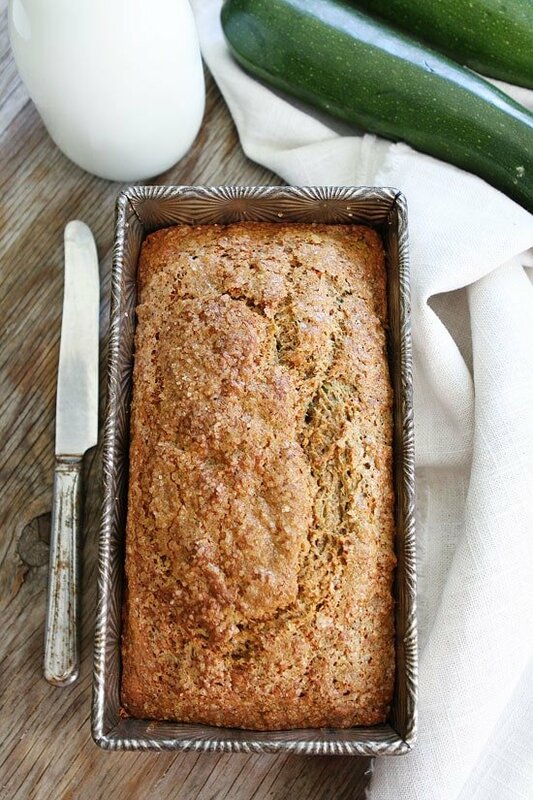 This Zucchini Banana Bread is great for breakfast or snack time. And go ahead and slather some butter on a warm piece, you will be glad you did! There is nothing better than a warm slice of bread with butter! Mmmmm! Oh, and this bread freezes well too so if you have a lot of zucchini and brown bananas to use up, make a few loaves! You can pull them out of the freezer when you have company or on a busy school morning for breakfast! 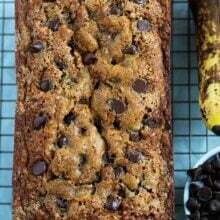 If you like zucchini bread and banana bread, you will LOVE the combination of both! 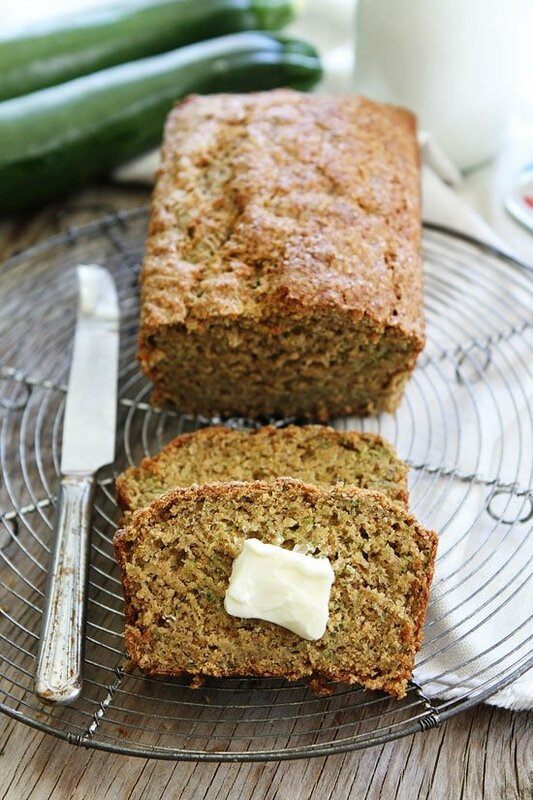 This Zucchini Banana Bread is the best of both worlds! Enjoy! 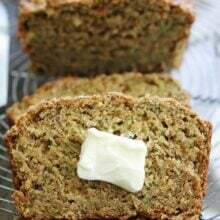 If you like zucchini bread and banana bread, you will LOVE the combination of two! The best of both worlds! Preheat oven to 350 degrees F. Grease a 8x4-inch loaf pan and set aside. Note-you can use all-purpose flour or regular whole wheat flour instead of white whole wheat flour. Store the bread covered with plastic wrap on the counter for up to 3 days. This bread also freezes well. Wrap in plastic wrap and a freezer bag and freeze for up to one month. Defrost before slicing. If you want to make muffins, line a muffin pan with muffin liners or grease cups. Bake for 20 minutes or until a toothpick comes out clean when inserted into the center. Will make 12 muffins. This IS the best of both worlds and so needed in my kitchen right now. Seems like it happens every year, but I hit a wall when it comes to ways to use zucchini – banana bread is definitely in store this week! I just updated the recipe! Thanks for catching that! Genius!! I have some leftover zucchini and can’t wait to give this bread a try! I updated the recipe to include muffin instructions. Bake for 20 minutes, will make 12 muffins. Your right, it is the blend of my two favorite breads! so good Maria! I love stuff like this! Sounds like the greatest hits of everybody’s fave loafs…has anyone tried this with gluten-free flour? Thumbs up? I haven’t tried a gluten-free version. I usually have success with Cup4Cup flour. Use the same amount as listed. Beautiful bread!! I wanna slice! What a delicious combo! I like to make these kinds of breads on Sunday afternoon and then the kids have them with yogurt for breakfast on Monday. It’s easy and healthy and a little more special than cold cereal or toast. Our boys love this bread! I’ve made it several times and it never lasts long! SusieD, I was thinking about King Arthur G.F. All Purpose Flour. I bet it would be great. I’m pretty sure I could eat a whole loaf of this bread myself, especially when it’s warm from the oven with butter! I was given and VERY large zucchini today from a client, & it just so happened that when I arrived home this evening this recipe was sitting in my inbox. Enjoying a piece right now as I write this…Absolutely delicious! Thank you! Yay for zucchini! So glad you liked the bread! Such a great mash-up and totally the best of both worlds! Good to know that it freezes well, may have to stock up! Delicious! What a great breakfast bread! Note to self: Buy loads of bananas so I can make this scrumptious zucchini banana bread! What a sneaky and smart way to get your boys to eat their fruits & veggies! I see a lot of this in our future with all the zucchini going on lately. I want this in my belly!! I’ve made Zucchini Bread before and I’ve made banana bread before but I’ve never combined them! I bet that flavor combo is fantastic! Pingback: . link love 8/23 . - . running with spoons . This is my favorite recipe of Zucchini bread hands down. Made it today and shared it! I loved that this wasn’t sickeningly sweet– it was just what I was looking for. I was worried that using whole wheat would mean ‘sorta dry’, but the texture wasn’t compromised at all. It was perfect! Thanks! I made a batch of muffins using this recipe and it is genius. I was also worried that using whole wheat will result in a dry texture, but not at all. The crumb is perfect, delicate and moist not overly sweet. Meant to freeze some, but didn’t make it into the freezer. They are gone!So making another batch tonight. Thank you! Oops! I read wrong! I see it now! This was my first recipe of yours to make and I LOVED it!!! It’s one of the most delicious beads I’ve ever made! I love the ingredients that are used so I feel good letting my two year old some have this as an occasional treat. 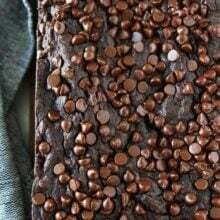 Thank you for posting such a great recipe – I know I’ll be trying more of your recipes in the future! I am so happy you liked the bread. I hope you keep trying our recipes! Thanks! Made this last night, and between me and my 3 littles, we ate half the loaf this morning for breakfast! Delicious! Made this yesterday and it is awesome… Very tender, very moist, very yummy! I added walnut, but otherwise followed your recipe! It’s a keeper… Thanks! I just made these and they were delicious! I doubled the recipe, but I didn’t fully double the sugar and could have omitted even more. It made 18 muffins. Can I sub applesauce for the coconut oil? These muffins were a hit with my 4 year old son and his friends. I had to send the link to other moms because their kids were asking for them. Yummy and moist. I have one very ripe banana and lots of zucchini. Any idea if it would compromise the taste or texture to use less banana and more zucchini? Thanks! Delicious, rich and moist! Thanks for the recipe(s). Always seeking ways to make the old favs gluten free without tasting gluten free. I looked at both your choc/banana bread and this recipe. I made the later today using 3/4C cup4cup Gluten free flour and 3/4C cocoa, subbing ground flax for the oil, and 1/8C agave for sugar & added chocolate chips. I’m sure both of the original recipes are even better and vow to try them! Yay!! Glad it was a success! This was super delicious! Easy and quick to make and the cinnamon and zucchini made it more exciting than plain banana bread. I had a little less flour than required but it still worked. The tip about squeezing out the zucchini is super important! So delicious! Made it vegan by using a vegan egg. This bread was a huge hit! Made this for the 1st time last week! I am in the middle of making my 2nd batch! 1st time I made it into a loaf, this time I am making muffins! So incredible delicious! Made exactly as the recipe calls for and it was delicious!!!! So so happy with this as a healthier baked treat! Wow!!! this was hands down the best bread I’ve ever made! made the muffins ! thanks so much! 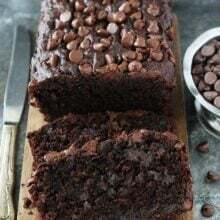 Excellent recipe – tasty and moist. Any chance the recipe could be adjusted with less sugar? Any suggestions or thoughts?? I am sure you could use a little less sugar. Start by reducing by 1/4 cup. This is a great recipe! Was a big hit. This recipe turned out great!! So delicious and the perfect way to use up overripe bananas and a plethora of zucchini. Thank you! I think the baking times may be too high. I baked it in a glass pan and pulled it at 47 minutes and it was way over done and dried out. I had great success with this – thanks! We made a small modification, leaving out the granulated sugar and using 4 bananas instead of 2 and it turned out extra moist and plenty sweet. We did muffins and made a cheater’s frosting out of equal parts whipped cream cheese and honey greek yogurt. My kids were all over them. Love this recipe! It’s my favorite recipe for when I have overripe bananas. Made exactly as is, always delicious! Also – used regular flour mixed with some oat bran, and the crumb was great.